Benter Akinyi is a 38 year old Community Health Volunteer (CHV) in Kowuor Village Ahero Town, Kenya. She joined CHV service because her community had a lot of problem with hygiene, sanitation and unskilled deliveries problems. She wanted to play a role in combating these issues and help reduce maternal and child mortality in her community. She was elected at the Chiefs Baraza, trained and enrolled as a CHV in 2010. She does her household visits from Monday to Saturday after tending to her farm. She recalls an incident in Kowuor Village when 25 year old Mercy Achieng who had a known pregnancy complication and had been referred to a referral hospital but was reluctant to go. On realising that she was about to give birth Mercy called Bentar on her cell phone asking for assistance. 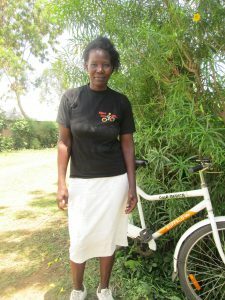 Benter quickly came on her Bike4Care bicycle and evacuated Mercy to Ahero SDH where an ambulance transferred them to Kisumu’s JOORTR Hospital. Fortunately Mercy delivered normally without any complication. Mercy is so grateful that Benter’s quick response using her Bike4Care bicycle saved her life and that of her child. No Comments to "Reducing maternal- and child mortality"